There are 57 Assisted Living Facilities in the Blue Bell area, with 3 in Blue Bell and 54 nearby. The average cost of assisted living in Blue Bell is $4,108 per month. This is higher than the national median of $3,346. To help you with your search, browse the 322 reviews below for assisted living facilities in Blue Bell. On average, consumers rate assisted living in Blue Bell 4.2 out of 5 stars. Better rated regions include Ambler with an average rating of 4.7 out of 5 stars. Caring.com has helped thousands of families find high-quality senior care. To speak with one of our Family Advisors about assisted living options and costs in Blue Bell, call (855) 863-8283. Blue Bell, ranked one of the 100 Best Places to Live in the United States by Money Magazine, is located in Montgomery County, Pennsylvania. The city is just 17 miles from Philadelphia and has a population of 6,400, of which 23.6 percent are over age 65. This large population of seniors can choose from three assisted living facilities within city limits and more than 60 in the surrounding areas. 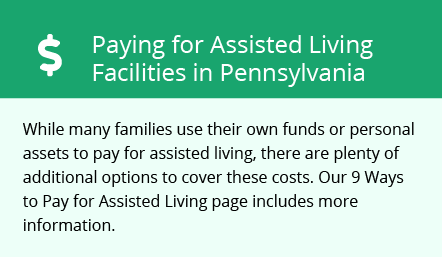 These communities are licensed by the Pennsylvania Department of Aging, Office of Long Term Living, Division of Licensing and are defined as facilities that offer private living units, assisted living services and supplemental health care services. The cost of living in Blue Bell is 44.3 percent higher than the U.S. average. This is primarily due to housing costs, but transportation and health care are also above average. This may affect seniors living on a tight budget. Groceries are comparable to the national average. Income from Social Security and retirement accounts such as 401(k)s and IRAs are fully exempt from taxation in Pennsylvania, which may leave more money for seniors to help pay for assisted living. Winters can get very cold in Blue Bell, which can limit outdoor activities for active seniors. Temperatures in January drop to 23 degrees Fahrenheit on average and snowfall is around 19 inches annually. Summers fare better with warm temperatures of up to 86 degrees in June. Rainfall is above average at 47 inches per year. Cars are the main mode of transportation in Blue Bell as there are no public buses. This may prove difficult for seniors who don’t drive. However, the TransNet program provides seniors over 65 with reduced-fare shared rides around Montgomery County. Seniors can feel safe living in Blue Bell as the crime rate here is low. The town is safer than 67 percent of other U.S. cities and violent and property crime received scores of 17.9 and 19.4 out of 100 (high crime) respectively. The Blue Bell area is home to world-class medical facilities, including Einstein Medical Center Montgomery and Suburban Community Hospital, in the event of medical emergencies or illness. Assisted Living costs in Blue Bell start around $4,108 per month on average, while the nationwide average cost of assisted living is $4,000 per month, according to the latest figures from Genworth’s Cost of Care Survey. It’s important to note that assisted living rates in Blue Bell and the surrounding suburbs can vary widely based on factors such as location, the level of care needed, apartment size and the types of amenities offered at each community. Seniors who are in need of financial assistance for assisted living may apply through Medicaid’s Community HealthChoices, a program that provides home care and support services but not room and board. This program is replacing the Pennsylvania Department of Aging (PDA) Waiver. Blue Bell and the surrounding area are home to numerous government agencies and non-profit organizations offering help for seniors searching for or currently residing in an assisted living community. These organizations can also provide assistance in a number of other eldercare services such as geriatric care management, elder law advice, estate planning, finding home care and health and wellness programs. To see a list of free assisted living resources in Blue Bell, please visit our Assisted Living in Pennsylvania page. Blue Bell-area assisted living communities must adhere to the comprehensive set of state laws and regulations that all assisted living communities in Pennsylvania are required to follow. Visit our Assisted Living in Pennsylvania page for more information about these laws.